This Grip-iT Dashboard Mount has a specially designed suction cup that will reliable stick to the uneven surface of a typical car dashboard. The benefits are that the driver can position a GSP device in the best location for viewability and comfort. 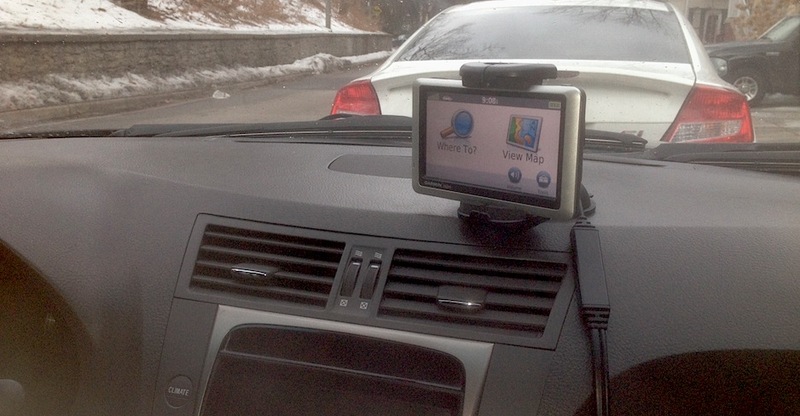 Normally, the suction cup of a GPS unit will not adhere to the uneven surface of a dashboard and the device must be stuck onto the inside surface of the window. In this forced positioning, the power cord dangles down towards the cigarette lighter in a distracting manner. Eventually, the GPS unexpectedly falls off from the window which can be very dangerous if the driver is caught off guard. To over come this issue, some drivers will rest their GPS on the middle console where the coffee cups are usually placed, but in this lowered position, the GPS is in a less than ideal location for safe viewing while driving. The suction cup portion of the Grip-iT Dashboard Mount, has the usual look and feel of the standard suction cup normally included with most GPS units. But the lower surface of suction cup of the Grip-iT Dashboard Mount is composed of some sort of soft, jelly like material that really does provide a solid adherence to the stippled dashboard surface. The suction material will not harm the surface of the dashboard and is easily removable at will. after one month, the GSP is still solidly attached. With the GSP in the desired dashboard position, the GPS screen can be comfortably viewed, does not block out the drivers view. The power cable is hardly noticeable as it basically rests along the surface of the dash to make a connection to the cigarette lighter. With the Grip-iT Dashboard Mount providing a solution in which the GPS can be located on a dashboard location of choice the driver can enjoy the experience and reducing any unnecessary distractions. The Grip-iT Dashboard Mount has a flexible grip which allows the mount to hold a variety of gadgets ranging in size from an iPhone to various larger sized GPS units. The big concern is whether or not the suction cup will stay stuck to the Dashboard and our tests reveal that the Grip-iT Dashboard Mount does indeed safely and reliable stick to the location on the dashboard where its it mounted. Mounting is a very simple procedure and only requires the area on the dash and the suction cup to be cleaned with something like a ‘wet one’ or ‘handy wipe’ product. The Grip-iT Dashboard Mount is a very practical system for mounting a smartphone, GPS or other portable device on a textured dashboard – a winning product! January 20, 2014 in Technology Review.